For once, it wasn’t me. The party running late, this time, was autumn. Oh sure, the light changed, spearing over the land at that long low angle that first alerts me summer is waning. And, yes, leaves of sticky geranium and Rocky Mountain penstemon flared scarlet here and there against a backdrop of grass cured to wheaten monochrome. On several early October afternoons, I heard the peculiar belling, fluting, honking calls of Sandhill cranes drifting down from on high, as small flocks of the big birds threaded south toward their wintering grounds in New Mexico. The horses shed short gleaming hairs and began to put on their puffy winter coats. 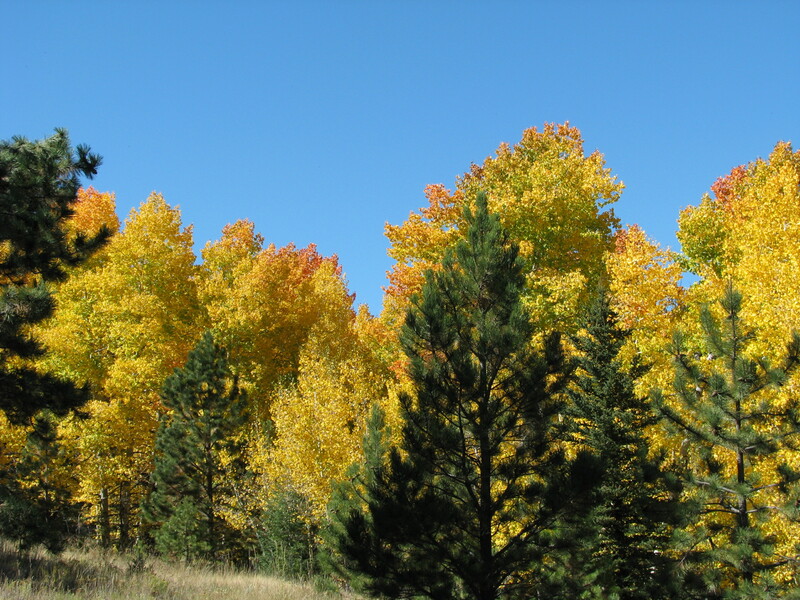 Changing aspen leaves emitted slow-motion flashes of bright yellow from dark evergreen stands, and the oak brush flared, more slowly, in tones russet and rust. The lusty whistling of bull elk rang through the crisp air for weeks. Through it all, though, no frost—at least not a heavy killing one. As I dug potatoes and shifted the horses to the cold-weather routine of evening feedings at the barn, I was still picking cold-tender vegetables in the garden. In the waning days of October, we have enjoyed fresh-picked cucumbers and yellow squash and salsa made from homegrown, vine-ripened tomatoes and tomatillos. The last of the Speckled Trout’s Back lettuce, having bolted and grown tough and bitter, was felled by my tugging, not by icy air on a cold night. Living in a harsh environment, I’m sensitive to the weather, but I had not realized quite how thoroughly I align autumn with the onset of freezing temperatures. In these times of shifting climate, unusual episodes like this fall’s warm spell take on heightened significance. I worry about what’s coming. I fret over what might be lost, including the opportunity for collective humility, given that we humans have now demonstrated a capacity to alter global forces once thought beyond our control. Although Big Thoughts like these have churned through my head lately, I’d be lying if I said I wasn’t preoccupied with smaller things. Like those tomatoes. I was pretty pleased with myself last spring, when I managed to nurture them from seed to seedling to transplant. They grew modestly in the cold and rainy weather of early summer, but bloomed dutifully and by August were putting on little green marbles. Our first frost usually arrives around Labor Day, though, so August is late summer up here. The early cold snap bypassed us this year, and I managed to pick a (small) handful of tomatoes before we left on vacation in mid-September. I told the neighbors who were watching our place to enjoy whatever survived. I was thrilled to pick some more ripe tomatoes when we got home. The first week of October, when we usually get the frosts that missed us in September, passed without a freeze. I kept picking, a few tomatoes at a time, as they ripened on the vine. Come late October, I rescued the “last” of the green tomatoes in anticipation of a hard frost—three different times. 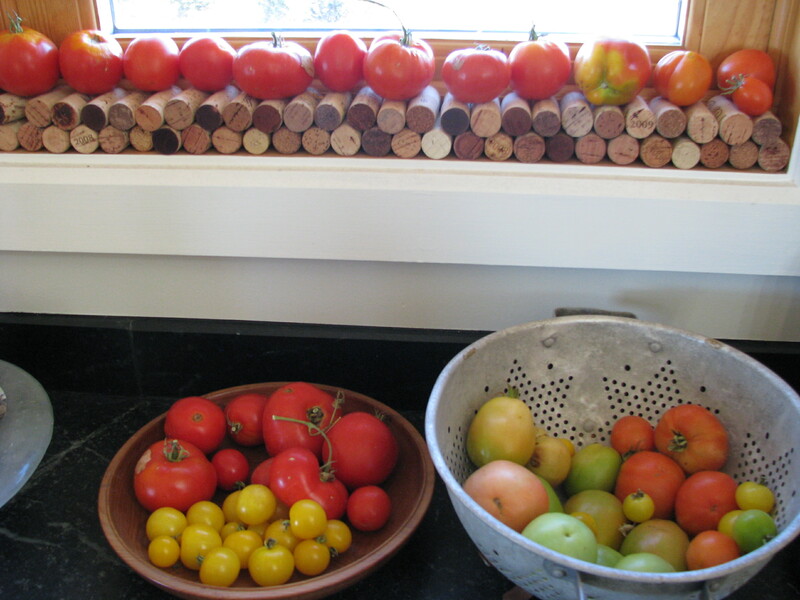 One phase of the October harvest (the wine corks on the windowsill are not homegrown). The end result has been an unequivocal bumper crop. Now, “bumper crop” is not something I ever anticipated being able to say with regard to tomatoes grown in my garden. I’m just not a bumper-crop gardener, to start with—the garden is small; I am not particularly attentive; and although I experiment all the time, I don’t necessarily keep track of what works and what doesn’t. I haven’t mastered sheltering plants with seasonal covers that would extend our short growing season. So, even though I can take credit for getting the tomatoes started and keeping them alive over the summer, I owe the successful harvest to an aberrant fall. I still don’t know how the short-season tomato varieties I tried this year will fare up here, because we didn’t have a short season. I’m not ungrateful for the mild autumn, but the tomatoes feel, just a little, undeserved. Two extra months of growing time is a weather mega-millions jackpot—and I didn’t know I’d bought a ticket. The long shafts of morning light are, finally, angling onto frost-silvered grass. 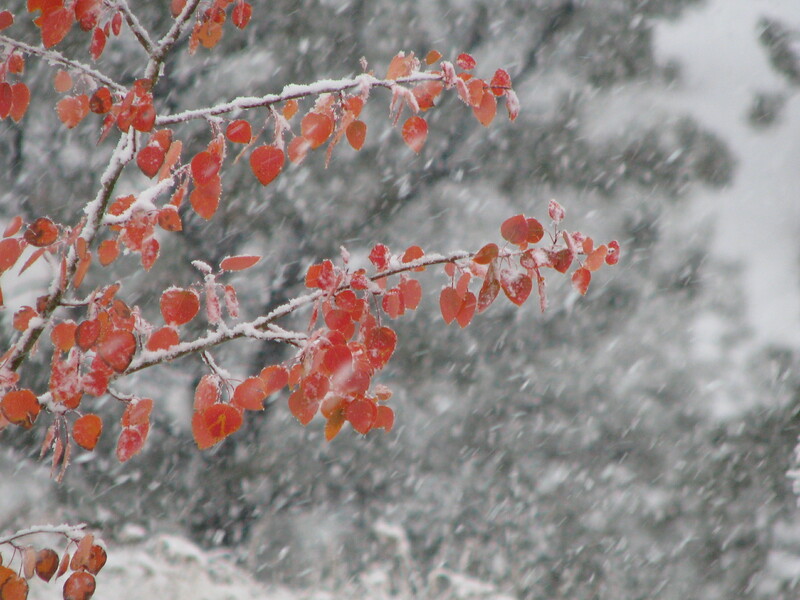 The first snowstorm of the year arrived last week, soaking earth that dried out in August and was further parched by the unseasonable warmth of September and early October. The Sangre de Cristo mountains and Pikes Peak are dusted white. Now that the marigolds—and tomato plants—have finally frozen, I’ll finish fall cleanup in the garden and put it to bed for the winter. Now that we’ve polished off that last batch of homegrown salsa, all seems right with the world. This entry was posted in change of seasons, fall, gardening, observation, weather and tagged climate change, growing tomatoes. Bookmark the permalink. Glad you like the colors! They come in small doses around here, not in vast swatches, but they certainly reward my attention. May the fall season be treating you to beauty wherever you are. Thank you for visiting, and for sharing.